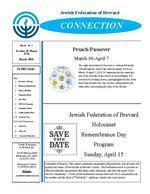 Jewish Federation of Brevard, Inc. Copyright Connection- Jewish Federation of Brevard, Inc. Permission granted to University of Florida to digitize and display this item for non-profit research and educational purposes. Any reuse of this item in excess of fair use or other copyright exemptions requires permission of the copyright holder.